The world of blogs has always been a distant one to me. I've read blogs but in my daily life the only ones that reach me are hot topic blogs that my friends post on social media to start Facebook wars over highly political topics. 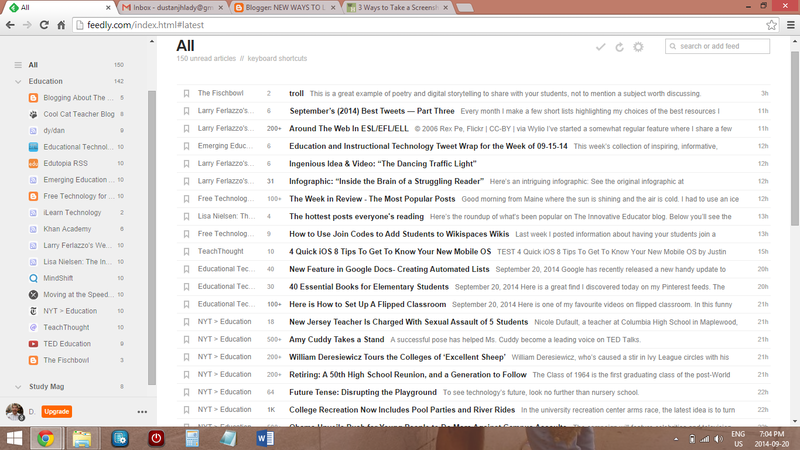 Feedly is an amazing tool for sifting through the world of blogs to find what you actually want to read. It works in much the same way YouTube or Twitter does, allowing you to search for specific blogs or types of blogs (using hashtags) or you can go into human-curated topic zones. I went into the education topic area and used #edtech, #education and #teaching to find some amazing blogs I would not have found otherwise. One thing I really like about Feedly is that it is a cross-blogsite website, so I can get blogs from Wordpress, Blogger and individual websites. 3. Dy/Dan-- Dan Meyer is a Math teacher whose approach to teaching is why I love his blog. Not only is his blog practically helpful for math teachers, his student-centric approach to teaching is refreshing and evident in everything he writes. One example of this is his recent post on Sports themed Math problems. 2.Mind Shift-- This blog is run by two radio stations in the States' KQED and NPR. This isn't the first place I thought I would find a good education blog. This blog is a little different because the articles are not written from personal experience. What I like about it is they curate an idea from a broad subject we wouldn't necessarily immediately pair with education. Then they ask what the educational implications are for that idea. A good example of this is a TED video they posted recently on how humans prefer repetitive patterns in music (and maybe in everything else). 1.Educational Technology and Mobile Learning: Yes, they need a flashier name but this blog I think will be one of the most practically helpful blogs of my career as a teacher. It not only keeps you updated on new technology. It also includes all aspects of learning theory. For instance their newest blog is about a program for project based learning. The program is an online checklist. Like I said, practical.